Great to see how this thread has developed and the good examples and ideas. I like the simplicity and tidy resolution of the Antal ring. I've just reworked my set-up with a 20/14 Wichard frictionless ring. 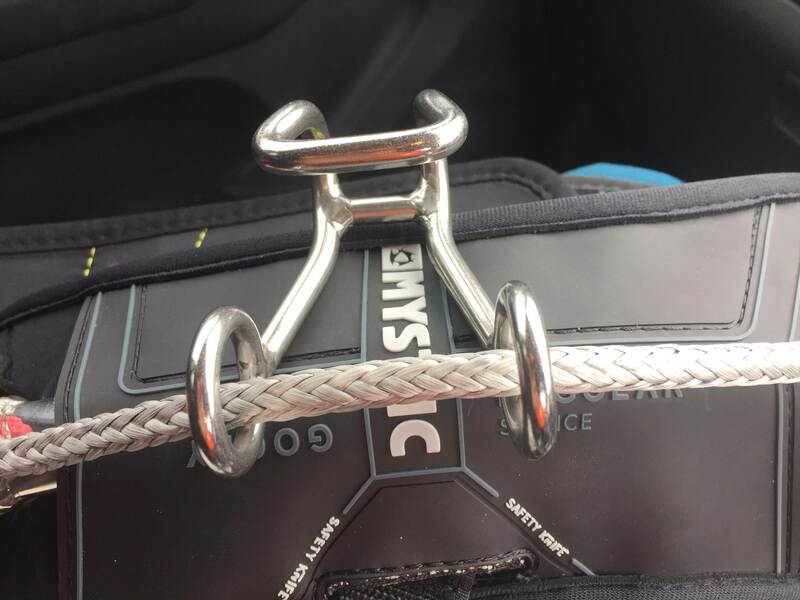 This particular ring has a lip in the groove that grips perfectly my Cabrinha CL - so potentially avoids any slack line jump outs - see pics - and no need to shorten the DD to hold the CL in the ring. I also added a slackened second spectra line as a back up. The immediate advantage is a reduction in bar throw by about 60-70mm - compared with my old Cabrinha CL /bar set -up. Yet to test it out on the water, but very pleased with the set-up so far - thanks guys. The setup looks cool. Do you have any experience without the wichard ring? I mean connecting the chicken loop directly to the ropes. Nice work Leigh, found this pic & thought it looked pretty neat. @ Blettie, pm me if you want to build one similar to mine mate. May be a naive question, but does this work without the Antal ring? Only the chicken loop attached to the line. Yes, it will work - CL straight on the rope. Note: I don't jump, just surf. Great set up. Pretty rare if both ropes snap. Love that Antal ceramic non friction ring. 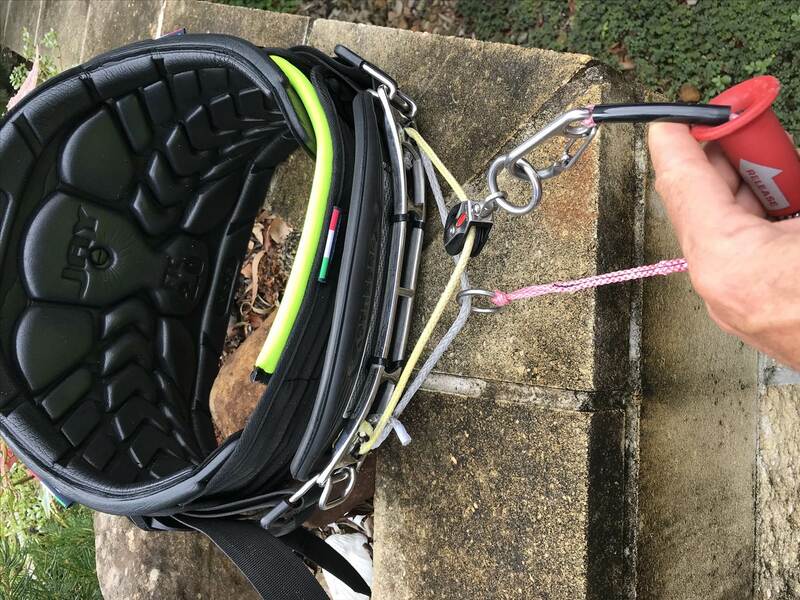 I tried the same size Antal ring with the chicken loop and harness rope running through together. What prevents the chicken loop from unlooping from the Antal ring when there's no pressure holding it there? Maybe the extra hose size around chicken loop.? Interesting set up gets you closer to harness. Watch the Antal ring, once you burn through the coating and begin to slide against aluminum it wears the rope out very quickly. I will check on the rope thank. Of all the sliding hook a tried the Antel is the best for me. Very smooth. It is worth replacing every time worn out. 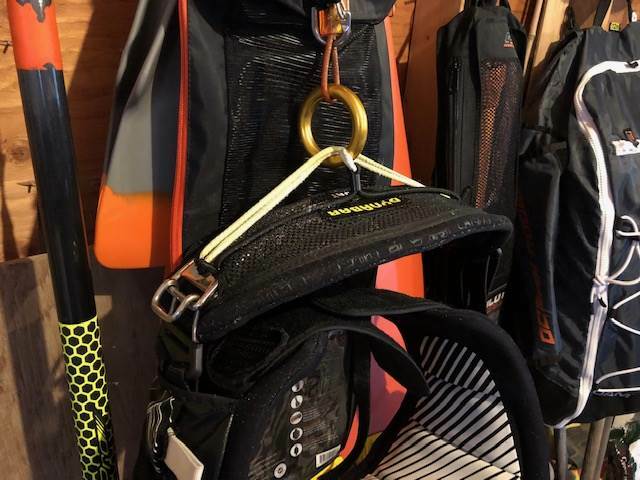 I've tried c-loop straight on the rope, it does wear the cloop and I don't like the feel as much as the pulley system I run on all my harnesses now. I've also tried stainless and Antal rings, Antal is better than a 3mm stainless ring, SS rings wear the rope quite quickly and are not as smooth running as the Antal. Check that you chicken loop releases cleanly if you use an Antal ring, some chicken loops may get hooked up and not release. 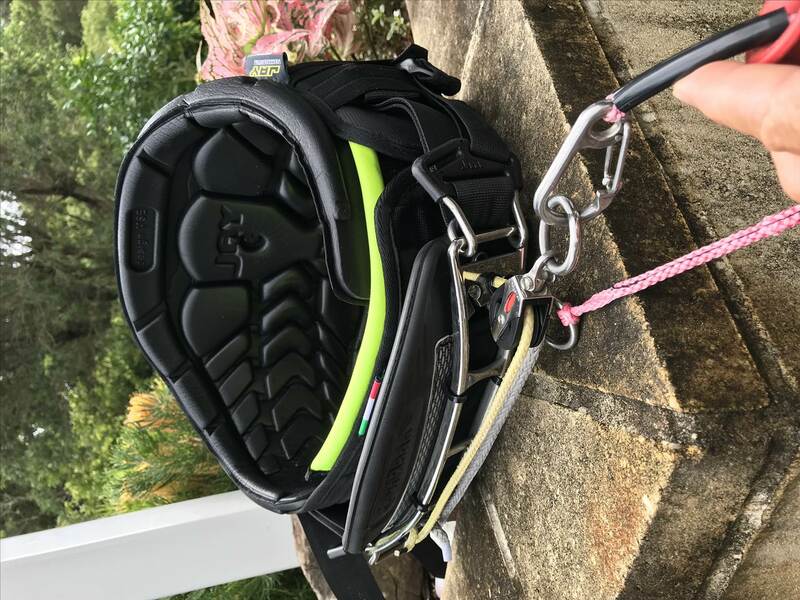 The Jay harness will be available here in Australia next summer, its liner is closed cell EVA foam and it does not absorb water, so stays light and is very comfy. just want to share with you my last setup, RE hexcore 2018 with 2017 carbon bar. 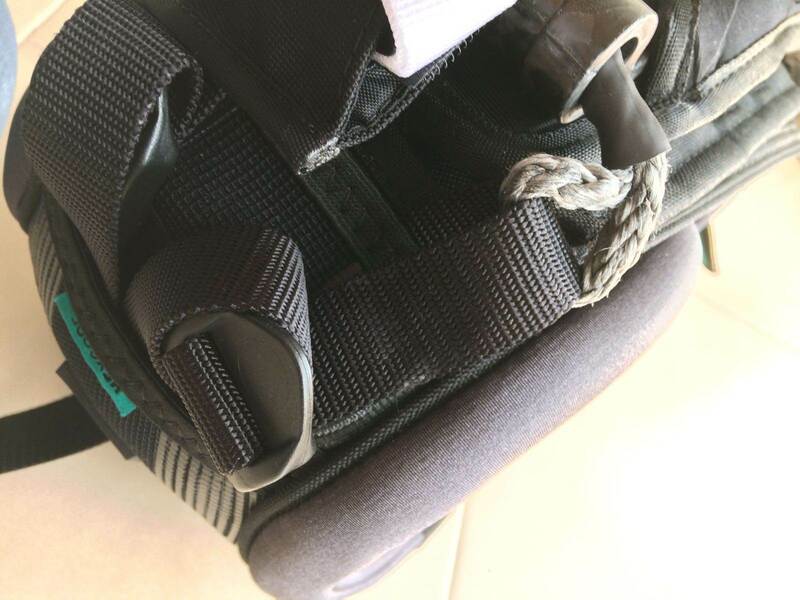 On the left side I've used dyneema loop covered with heat shrinkable tube to connect with webbing straps. 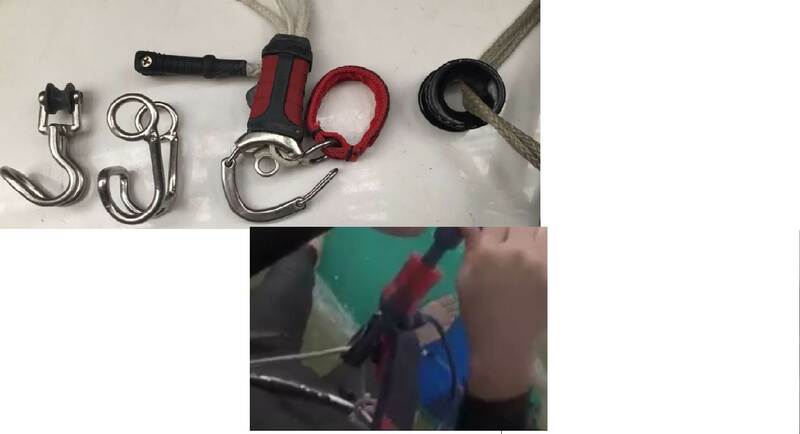 On the right 2018 the original metal square loop covered with hot glue to avoid carbon/metal connexion. I'm using a XS harness with a 12" bar and I think it's the best setup I've ever had. The ride of the loop (left and right) it's quite big and feels like hips are even more free. Nope, as I haven't need to. 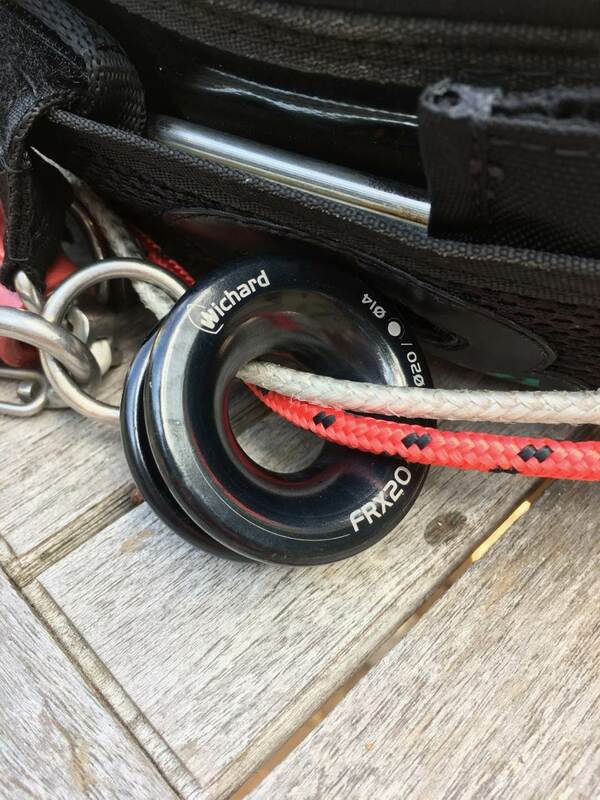 The Wichard ring is terrific - no wear and tear on the ring or rope after a lot of kiting this past season - Just took this pic to prove it. The chicken loop never jumped out, not once - and its travel is smooth as. Why stuff around with pulleys or high friction set ups? the ropes wear out even with a pulley, believe me, I think the Antal/Ronstan/Whatever ring would be even less friction. 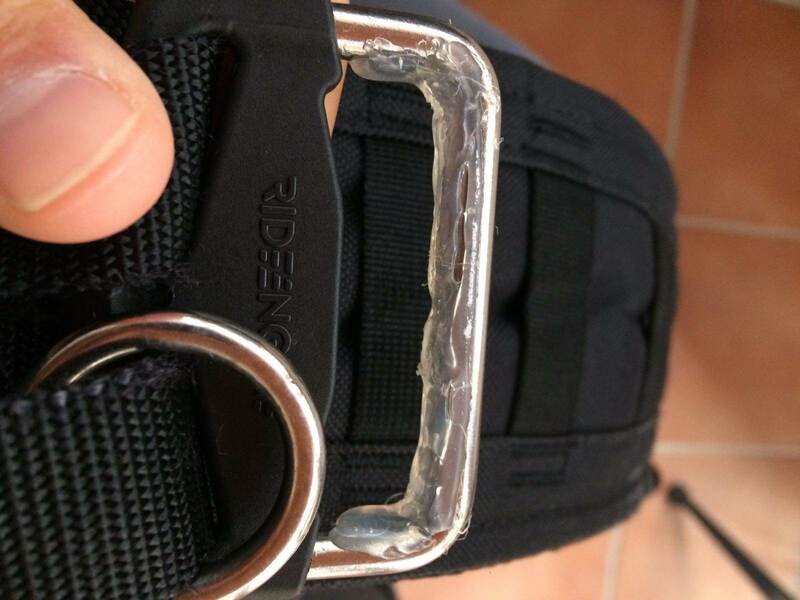 I once had mine break and was able to continue kiting on the backup rope> Good idea to check regularly or change every 6 months or so but you don't want to be paranoid. 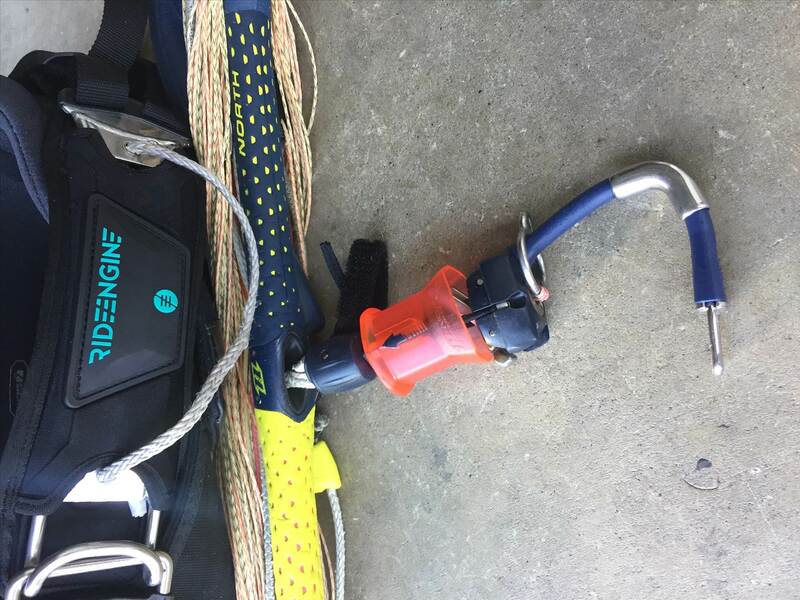 pepperdurso or anyone else on the newfangled "wave" harnesses, you should think about a second backup rope. 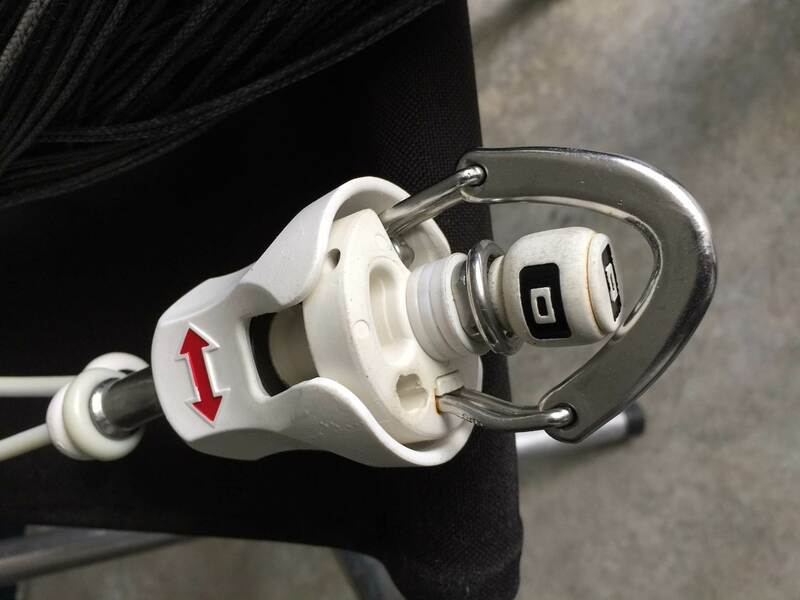 Thanks Pehai, I'm definitely checking my rope every month, although I guess my swivel is not going to wear the rope out very quickly...we'll see! 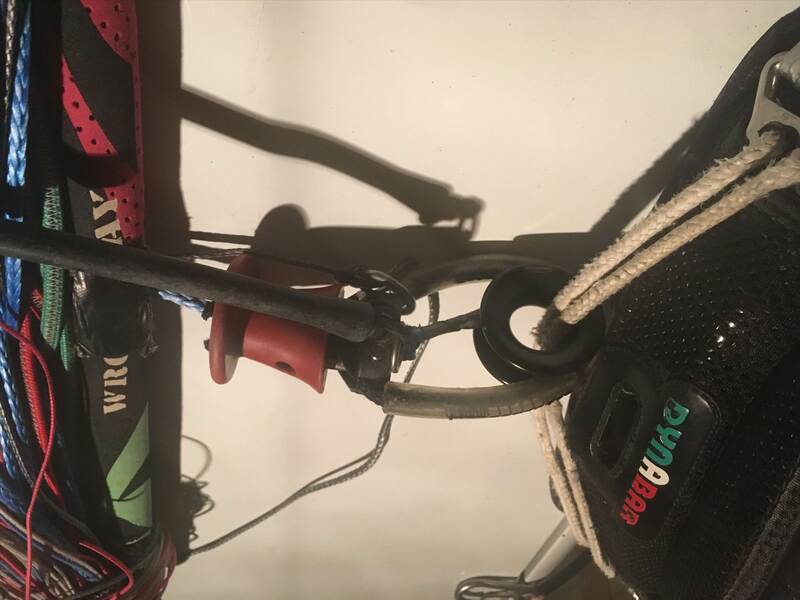 If you are finding ropes are prematurely wearing out (which I am reading has happened) you may wish to consider moving to ropes that contain dyneema core and a polyester cover rather then pure dyneema. 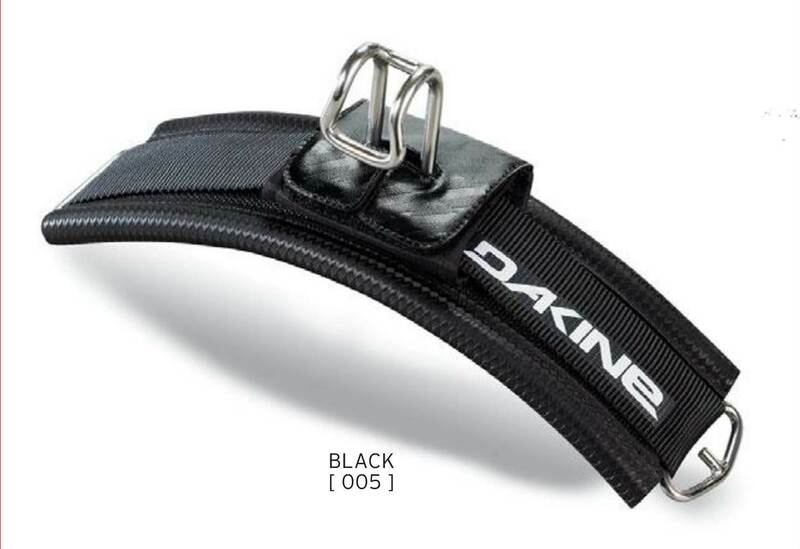 This would contain the same strength as dyneema with the added chafe resistance of a polyester cover. Marlow excel racing (www.marlowropes.com/product/excel-racing-dinghy-leisure-marine-rope), liros or fse robline make suitable options. Also in my opinion and sailing experience a friction ring will never be as good as a pulley whilst under load and moving a lot. A pulley will move better under load due to the bearings in it and cause less chafe then a ring. Friction rings are lower maintenance then a pulley but id still use a pulley. I've found melting beeswax into the dynema rope has helped give a longer lifespan. I used to melt wax from tea lights and that helped, but the beeswax appears to offer a better lifespan in my experience so far. I use blocks/pulleys on my rope. Yeah don't use sheathed rope. The problem with sheathed rope is that you cannot see the damage that is happening under the sheath. 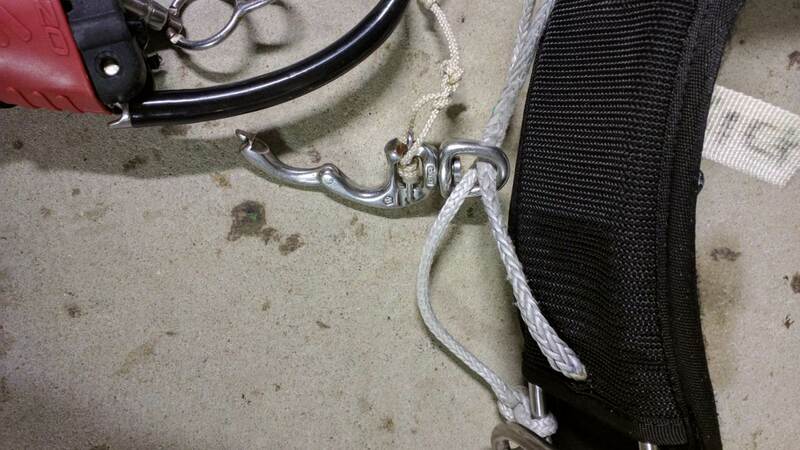 I had a rope let go that looked good, but inside the dyneema had been getting damaged by salt crystals and fine sand. 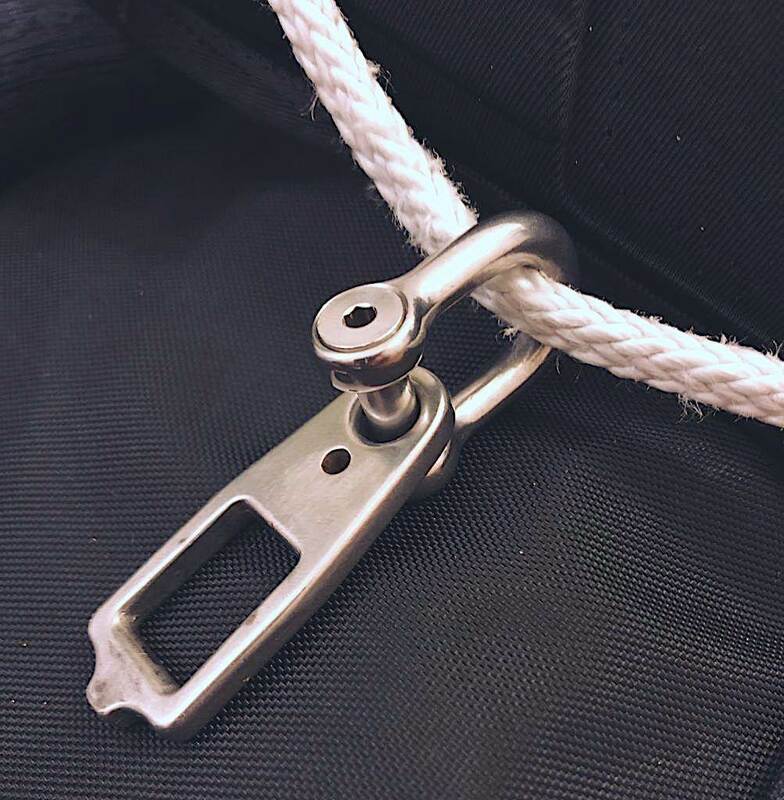 The best thing to do is run a piece of 3mm dyneema inside a piece of 5mm, easy to do and you have a back up inside the larger line that gives extra strength. The original dynabar ropes are doubled. It took a few rides to become familiar with as I found it quite different. Have found that I tend to ride with a little more kite/power with this set up than I have in the past. The rope slider is definitely better IMO if you are riding waves, unless you like to ride unhooked. 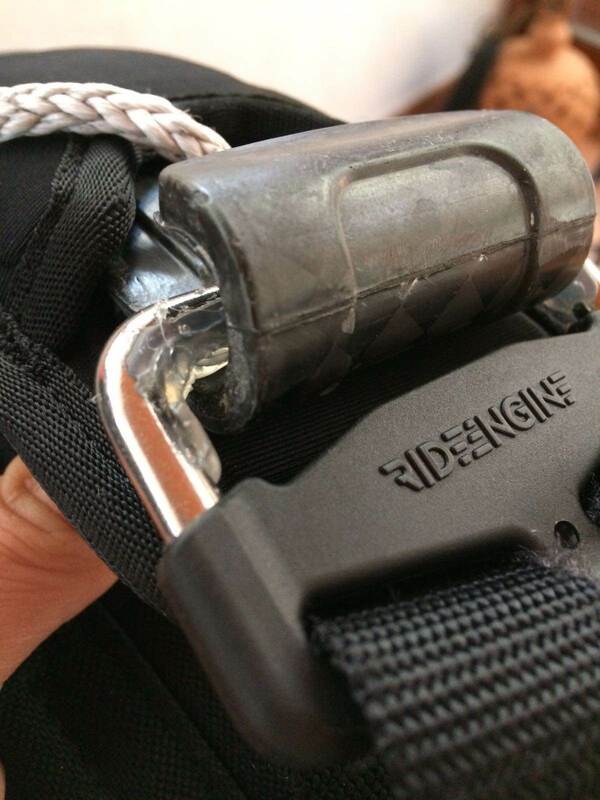 I like to ride/unhook on days when the wind and waves are constant and have kept my old harness for those rare days. 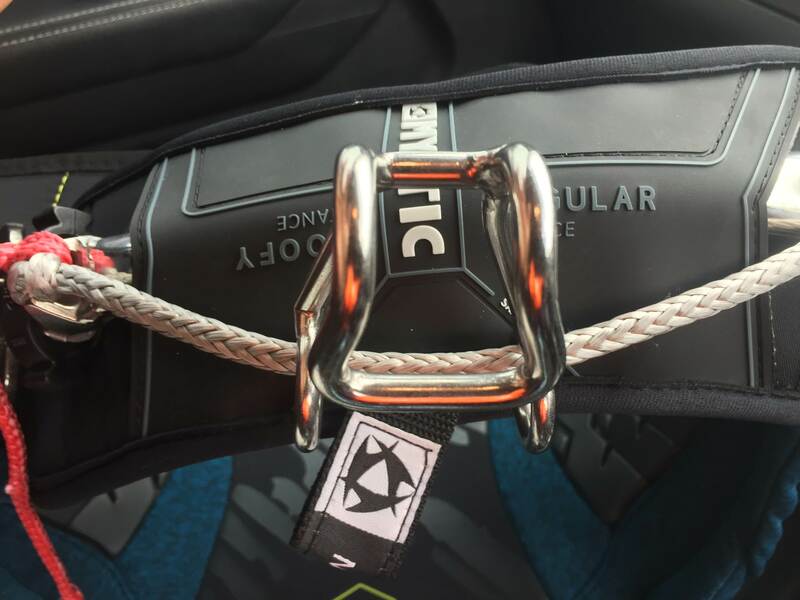 I have the Mystic X great harness and I attached this hook to the rope slider. Works great and I can still easily self launch/land. Find a neat and simple solution for cabrinha fireball users, just disassembled the lower part of fireball and connected with a Wichard 1303. This is my new Cab bar with the BRM treatment, been using this mod for 4 seasons now. I have been rolling one of these last few years really like it..webbing lasted 3 years replacement was $15. I like that it slides smoothly and doesnt jump around also it sits closer to the waist, it also extends further around than most rope sliders. I have used the same for few years now. works great. I installed a climbing " ascending ring" cheap and perfect, just get big enough that all chicken loops fit thru it. That looks schmeckle! but am i missing something? Theres no swivel? and if the line between red ball and slider ring breaks you loose everything? primary safety is the green ball? Yes, if it breaks I loose the lot but it's made of 4mm Dyneema with about 2000kg breaking strain. All the load/wear is taken up by the SS rings, it's easy to change the LFR to a pulley with swivel, I have that on my old bar. Green ball is the push away primary that flags to one front line. Red ball, pull for full release. Reading this has given me a nudge...Too informative - more mods coming on - need to go shorter!! 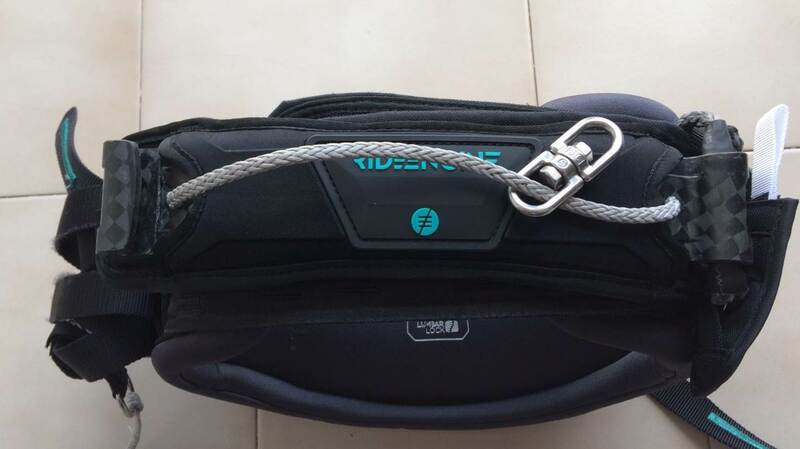 A lot of kitesurfers are using this Wichard snap shakle, especially in competition (kitefoiling). They however mount it the other way round so that you push to release (good luck releasing the shackle when there is no line tension in the setup above). Wichard has warned against using it for kitesurfing. I suppose they just wanted to cover their arses as I've never seen an issue with it when mounted properly. 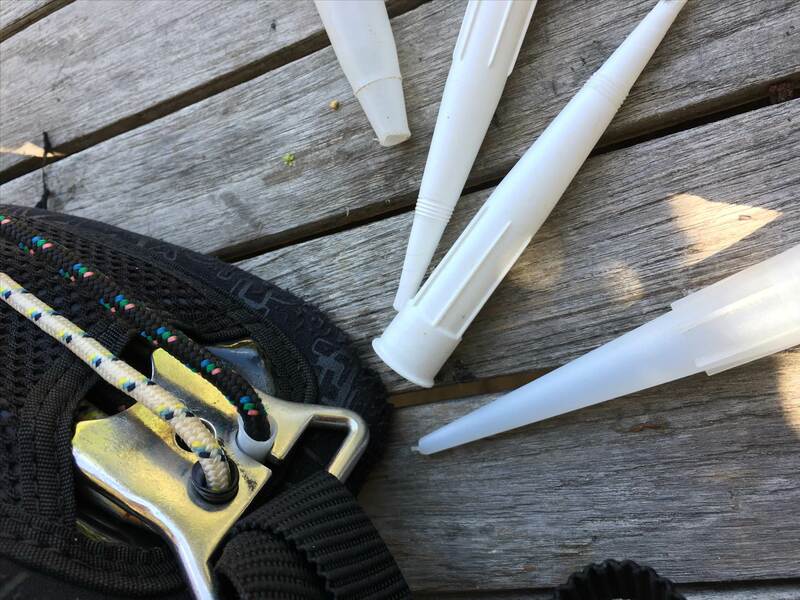 For those liking Core bar: slingshot talon can be adapted in 10 min with vise grips. Cool, how did you do that? I got one last Feb and used it last year, mostly with the foil. Smoother and faster than the Dynabar (no bungy I guess) but the chicken loop jumps out a couple of times every session. Apparently I do a lot of slack lining of the kite on the surf foil... Fine on the TT though; constant tension. Also, not being able to tether launch or land, or swap gear easily was a bit of a pain. I'll be going back to the Dynabar I think, for general kiting. 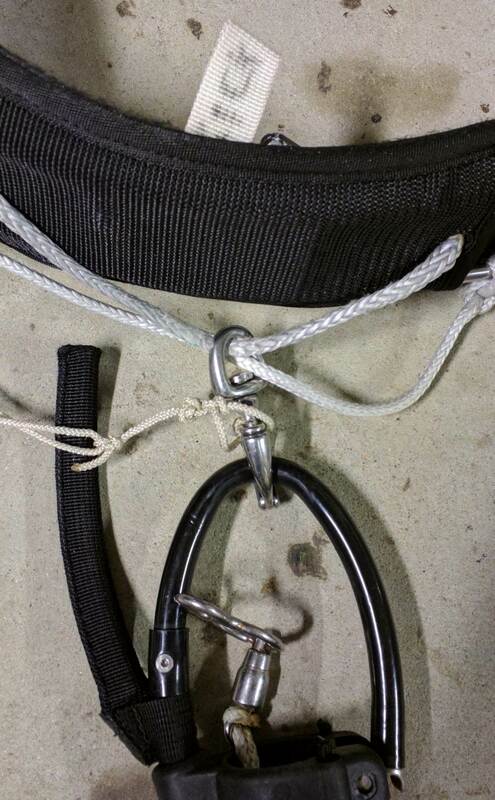 This is a further tweak to my twin rope set up on a Dynabar. I had a rope fail at the point where the rope drops thru the Dynabar. The main rope has a plastic bush to protect itbut the other rope didn't..... till now. I tried using heat shrink and rubber grommets - both helped but ultimately failed. So this solution seems to work really well. Using a short conical section cut from a silicon/caulking gun nozzle, passed thru the back of the bar to it jams in nicely in the hole and it protects the rope from abrasion.